Anne Hegberg, left, an occupational therapist who specializes in helping drivers compensate for any lost skills, with a client, JoAnn Mantzke, 80. As the National Highway Traffic Safety Administration said in its five-year safety plan for older drivers , released this month, the effort involves both behavioral and technological changes. But first, here’s what the statistics show: Most people assume that accident rates increase as drivers age, but the groups that have the highest fatal crash rates are teenagers and those 75 years and older, said Sharon Gilmartin, a spokeswoman for AAA. “From 65 to 70 years old, you’re looking at rates similar to middle-aged drivers,” she said. In fact, older drivers are often safer, because they are less likely to speed, drive drunk or text while driving. But per mile traveled, fatal crash rates increase beginning at age 75 and rise sharply after age 80. That’s not necessarily because older people have more accidents but because they are more fragile and less likely to recover from serious injuries, Ms. Gilmartin said. Teenagers are much more likely to kill someone else in a crash; older adults are far more likely to kill themselves. Only one state, Illinois, requires a road test for elderly drivers, while many require people 70 and older to renew driver’s licenses in person, rather than by mail or online. Some require more frequent renewals or written or vision tests as drivers get older. Take turning your head when making a lane change. As flexibility and range of motion decrease with age, that simple motion can become difficult. And that difficulty can cause accidents. But certain exercises can help. The Hartford and the Massachusetts Institute of Technology AgeLab, which is part of the university’s School of Engineering, have aseries of online videos demonstrating the exercises. seen car and trigger a light on the dashboard. The most helpful technology for older drivers, according to experts assembled by the Hartford and the M.I.T. AgeLab, include “smart” headlights that adjust the range and intensity of light to improve night vision and systems that warn the driver if the vehicle is straying from its lane. In its report, the National Highway Traffic Safety Administration emphasized advances in collision avoidance. Technology that is already available in some cars alerts the driver with a beep or light to obstacles crossing behind or stopped in front of the car. In some models, the car will slow if it appears that the driver isn’t braking. A lane departure warning, which notifies the driver if the car is drifting into another lane without a turn signal on, is another option. For the future, the Department of Transportation is collaborating with automobile manufacturers on vehicle-to-vehicle and vehicle-to-infrastructure communication. That would allow cars to “talk” to each other and to traffic signals, tollbooths and work zones, for example, to warn of dangerous roadway conditions, accidents and other potential problems. While all this technology is a plus for older drivers — and all drivers — it would be dangerous to rely on it too much, said Scott Oldham, editor in chief of the car site Edmunds.com. With the best car in the world, drivers need to be confident that their knowledge, skills and reflexes are up to par. The easiest way to conduct an initial check is to take an online screening assessment. AAA and AARP, to name just two, provide such questionnaires. AAA offers both a self-rating form and a series of computer-based exercisesthat can help you test your physical flexibility and memory. If the assessments raise a red flag, the next step might be to get an on-the-road driving assessment; rehabilitation centers often offer them. If a problem is identified, it might be fixable, and a driving rehabilitation specialist can help with that. Donna Stressel, a driving specialist in Schenectady, N.Y, who helped Mr. Cullon, said her company charged $420 for an initial two-hour evaluation and $125 for each additional hour needed. In some cases, medical insurance or Medicare will cover this as part of occupational therapy. But, she said, costs vary depending on the part of the country, ranging from $200 to $1,000 for an evaluation. She said that in the 25 years she had been a driving specialist, she had seen a large increase in the number of older drivers coming in for assessment and training. “The demand is greater than the resources,” she said. Too many older people fear that if they admit to any driving concerns, they will have to stop, said Elin Schold Davis, coordinator of the older driver initiative for the American Occupational Therapy Association. That kind of thinking leads to people driving with physical or cognitive problems that they aren’t acknowledging — or to stopping driving before they have to. 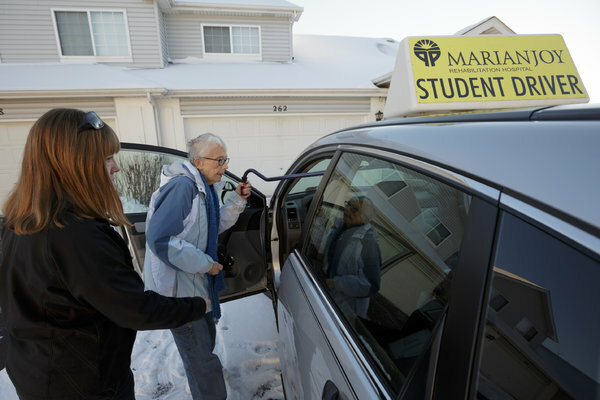 Anne Hegberg, a driver rehabilitation specialist at Marianjoy Rehabilitation Hospital in Wheaton, Ill., said many older drivers didn’t even realize they were doing things that could be a danger to themselves or other drivers. “They’ll tell us they’re not resting their foot on the brake, but we have a brake light visible in the front seat, so we can see that they are,” she said. Her job is to determine whether someone can undo bad habits with some lessons or needs to retire from driving. There are many options to explore; one relatively easy possibility is to drive only during the day or on local roads. Her organization’s website offers a list, searchable by ZIP code, of occupational therapists who specialize in driving rehabilitation. And who knows? In the near future, such quandaries might be a thing of the past. Older people might be giving up the car keys not to sit at home, but to hop into a self-driving car.